The new gaitway 3d is a joint design by h/p/cosmos and Arsalis. It measures the ground reaction forces and torques in three directions and comes in three different deck sizes: 150/50cm, 170/65 and 190/65cm. each size is optimized for a range of speeds. The gaitway 3D offers a rigid construction to record optimal quality signals. The functionalities include a patient weighing scale, a recording of the ground reaction forces at rates up to 10 kHz, left and right force measurement for the vertical force during walking and an extensive list of biomechanical parameters of normal and pathological gaits. Keywords: force plates, instrumented treadmills, gait analysis, motion analysis, sports biomechanics, sports science, locomotor therapy, gait trainer, active gait correction, restoration of gait, treadmill training, unweighting, body weight support (BWS), Body Weight-Supported Treadmill Training (BWSTT). wheelchair-bound patients, physiotherapy, central nervous system (CNS), stroke survivors, spinal cord injury (SCI), traumatic brain injury (TBI), neurorehabilitation, cerebral palsy (CP), multiple sklerosis (MS), Parkinson, Hemiparesis, increased muscle tone (spasticity), pathologic gait pattern, pathological gait, physiological gait, neuroplasticity, gait symmetry, biofeedback, robowalk. Gait analysis can provide important information about someone’s kinematic and kinetic motion patterns, risk of falling and balance capabilities. Motion laboratories worldwide utilise tools such as 2D or 3D motion capturing systems, EMG, pressure distribution insoles or platforms and force plates to qualify and quantify the overall movement, especially in walking or running. The new h/p/cosmos® gaitway® 3D is a powerful, innovative and accurate system in biomechanics not only for analysis but also offering on-line biofeedback for corrections in clinical gait rehabilitation and athletic running applications. The evaluation of the external forces acting upon each lower limb may be required, for example to estimate the joint forces and moments developed at the ankle, knee and hip by the inverse dynamic method. The most common ways to measure forces is to use force platforms or instrumented treadmills. Force platforms can accurately measure the six forces and moment components, but while they offer a lower initial investment, they have some disadvantages. For accurate data collection, it is crucial for the subject to hit the platform, with only one foot. Results will be inaccurate if the subject misses the platform, places only one part of the foot on it or touches the plate with both feet. This compels the subject to visually place the feet correctly on the force plates. As a result, kinematic and kinetic parameters and especially the variability of the step length will be affected (Meurisse et al, 2016). Oggero and colleagues (1998) reviewed their trials, and found that only 25% of their subjects would require three or less trials to obtain an accurate trial of one foot. Getting sufficient data for both feet can be therefore very challenging, time consuming, fatiguing and frustrating for investigators and patients and decreases the efficiency of a laboratory. Additionally, a setup utilising force plates requires more space in order to reach and keep a certain speed before hitting the plate. Nevertheless, force plates have to be mounted evenly into the floor, either in a pit our surrounded by a platform, which makes it very difficult to install retrospectively into an existing facility. Nowadays there are different commercial instrumented tread­mills available with different specifications. For example, pressure distribution platforms can be integrated underneath the belt of the treadmill. The pressure distribution, various gait and running parameters, COP, foot rotation, pronation, supination, gait symmetry as well as the vertical force can be calculated with the help of this technology (e.g. ZEBRIS). Furthermore an optometric system like the OPTOGAIT (Microgate) can be embedded and measure timing and positioning parameters. Measuring forces with strain gauge or piezo-electric load cells, however, is considered to be state of the art and the gold standard in a biomechanical lab. Force measuring treadmills became increasingly common in bio­mechanical laboratories as an alternative to over ground gait analysis, because they allow for measurement of repetitive strides, require less laboratory space and facilitate the measurement of ground reaction forces through the embedded force plates (Sloot et al., 2014). The initial higher investment will be balanced by a quicker data acquisition and an improved efficiency of the laboratory. Also notable is the possibility to easily regulate the constant speed of the treadmill, ranging from the gait of an elderly individual to a sprinting healthy athlete. Especially when it comes to pathological gait and clinical applications such as locomotion therapy, a treadmill is an indispensable tool. Unlike force plates, an instrumented treadmill can record an unlimited number of steps in a safe environment (harness for fall prevention and/or unweighting for partial body weight) on a treadmill. Combined with biofeedback and additional gait support via the robowalk® expander system, a modern instrumented treadmill is by far superior to conventional force plates in almost all gait applications. Because of the occurrence of the double contact phase in human walking, some manufacturers of force measuring treadmills followed the idea of measuring separately the forces under the left and the right foot. Some feature a side-by-side and some a fore-aft arrangement of two independent belts with force plates. 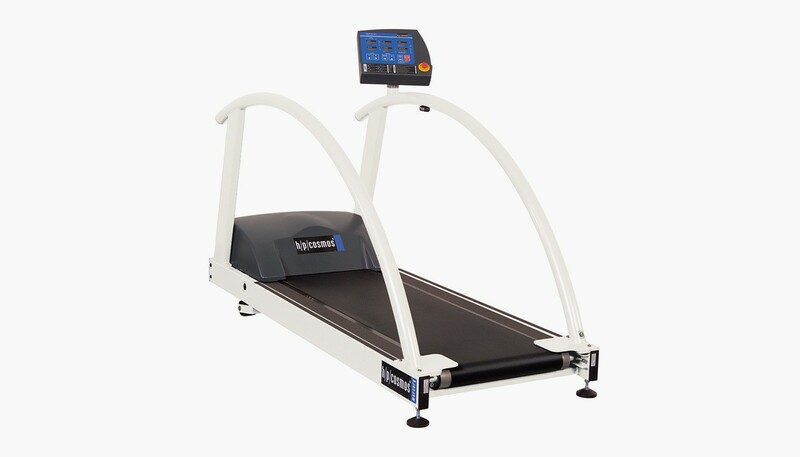 In both cases, the belt of the treadmill is split, which requires a specific position for the subject on the treadmill, in order to measure the forces distinctly. This forced position inhibits free and natural movement on a treadmill. For instance, Altman and coworkers (2012) found that the gait width was widened by 3.7 cm, on a side-by-side split-belt treadmill. Moreover, a correlated between this alteration and a reduction in peak knee and hip adduction angle was found. This may have resulted from the more constrained foot placement required as subjects attempted to keep one foot on each belt. They also noted that the 4 mm gap between the belts on the treadmill used in their study is quite narrow compared to the 1-2 cm gaps of most other split-belt treadmills (e.g. BERTEC 20 mm). With gaps 3 to 4 times as wide, the effect on base of gait is likely to be even greater, which will have a more significant effect on kinematics at a possibly medically important level. In addition, Zeni and Higginson (2010) concluded in their research, that step width might be the largest concern when using a split-belt treadmill. Furthermore, initial anxiety when walking on a split-belt treadmill, can cause an unnatural gait pattern. The h/p/cosmos® gaitway® 3d is different and consists of one large single platform that does not have a split belt. It is available in different running deck sizes like 150/50 (Fig. 1), 170/65 and 190/65cm. As running consist of single contact phases (just one foot on the ground at a time) the treadmill is perfect to measure forces also at higher speeds. The ample running surface encourages a natural running position. Moving slightly forward or sideward does not affect the measurement accuracy. Also when walking on the treadmill, the subjects do not need to worry about the position. They are not required to place the heel on the front belt, nor are they forced to hit the right belt with the right foot and vice versa. When walking on a single platform, the load cells will measure a sum of left and right limb forces, but only in the double stance phase. A dedicated algorithm can decompose this sum. The procedure was published some years ago and improved in subsequent years (Davis & Cavanagh, 1993; Dierick et al, 2004; Meurisse et al, 2016, Raison et al, 2005). This algorithm is validated now for both healthy and clinical gait and published in highly rated journals. Someone might say, an algorithm is a mathematical model and all models have their weaknesses. It is true, but the relative error is almost negligible, compared to those resulting from unnatural walking pattern on a split belt treadmill or on regular force plates. For example, Meurisse et al (2016) validated this algorithm at 374 steps of healthy and 437 steps of clinical gait. Their median of the relative error was 1.8% for the healthy and 2.5% for the clinical gait between the reconstructed and real measured forces. The reconstructed and the real ground reaction forces during double contact phase are strongly correlated for both healthy and clinical gait data. An example is shown in figure 3. Additional value to the gaitway® 3d single belt treadmill developed by h/p/cosmos in co-operation with Arsalis, can be added by incorporating a pressure distribution platform made by Zebris into the running deck as shown in Fig. 5. The pressure distribution assessment not only adds valuable information such as the COP under each foot during the double contact phase, the foot rotation angles and roll off analysis, but also offers an original methodology to improve the accuracy of the gaitway® decomposition algorithm and extend its application to the horizontal GRF components. Altman, Reisman, Higginson & Davis, I. S. (2012). Kinematic comparison of split-belt and single-belt treadmill walking and the effects of accommodation. Gait & posture, 35(2), 287-291. Davis & Cavanagh (1993). Decomposition of superimposed ground reaction forces into left and right force profiles. Journal of biomechanics, 26(4-5), 593-597. Meurisse, Dierick, Schepens & Bastien (2016). Determination of the vertical ground reaction forces acting upon individual limbs during healthy and clinical gait. Gait & posture, 43, 245-250. Oggero, Pagnacco, Morr, Simon & Berme (1998). Probability of valid gait data acquisition using currently available force plates. Biomedical sciences instrumentation, 34, 392-397. Raison, Detrembleur, Fisette, Penta, Samin & Willems (2005). Determination of ground reaction forces and centres of pressure of both feet during normal walking on a single platform. Computer Methods in Biomechanics and Biomedical Engineering, 8(S1), 227-228. Sloot, Van der Krogt & Harlaar (2014). Self-paced versus fixed speed treadmill walking. Gait & posture, 39(1), 478-484. Zeni & Higginson (2010). Gait parameters and stride-to-stride variability during familiarization to walking on a split-belt treadmill. Clinical Biomechanics, 25(4), 383-386.